This post is a part of the conversation around the ASCD Forum “Learning for All = Teaching for All.” To learn more about the forum, go to www.ascd.org/ascdforum. We are living in a time where content is ubiquitous. Learning today can happen anytime and anywhere—on the job, in the community, or online. The world is your platform. Technology and digital learning have enhanced learning opportunities for educators by expanding access to information and resources. With less emphasis on “sit and get,” the changing landscape in the world of professional learning has ensured that educators can take shared ownership and responsibility for their professional growth. And 24/7 access to collaborative tools, online communities of practice, and resources has ensured that professional growth is no longer limited to the hours of the school day. Professional learning opportunities that are diverse, customizable, and supported by the latest technologies support learning for all. Twenty-first century educators can choose what they want to learn, the way in which they want to learn, and when they want to learn. These principles are what the Edcamp “unconference” model is built upon. Edcamps have become a popular means for professional learning. These do-it-yourself events provide educators with opportunities to share best practices, either during sessions or over informal lunch conversations. Edcamps are highly successful because they are learner driven—learners can pick and choose what they want to do and learn. Much like what we want for our students, educators are now able to create their own professional learning paths. Through digital badging platforms, educators can learn what and when they want and then receive appropriate and authoritative credit upon demonstrating their learning. Digital badges in professional learning can be a powerful way to build and communicate reputation. By leveraging the latest in social media, digital badges can be used to tell a complete story of one’s professional learning for others to see. As technology integration continues to increase in our society, it is paramount that teachers possess the skills and behaviors of digital-age professionals. Educators must be comfortable teaching, working, and learning in an increasingly connected global and digital society. Self-directed professional learning opportunities have allowed educators to take responsibility for their own growth. Modeling these practices and being transparent with their own learning can serve as a model for the kinds of learning experiences they want to bring to their students. Billy Krakower is a computer technology instructor and gifted and talented teacher at Beatrice Gilmore Elementary School in the Woodland Park Public School District in New Jersey. Krakower is an ASCD Emerging Leader, an author, and one of the moderators of #satchat and #njed. Connect with him on his website or on Twitter @wkrakower. There is a buzz in schools around the Science, Technology, Engineering, and Mathematics or STEM. Schools across the tri-state area are adopting or finding ways to incorporate STEM into children’s school days. Often there is a discussion whether or not it should be STEM or as some of the people call it STEAM (Science, Technology, Engineering, “Art” and Mathematics). What is the difference often comes down to the ways in which people will interpret the meaning behind it? In my mind, the A is important to add to the discussion when we are talking about STEM. It makes sense to add the A, from this educator's standpoint you want students to become creative when designing. Having the A expands the idea of STEM into STEAM and allows for a more rounded student learning experience. Students are often very engaged in learning about STEAM and learning valuable skills such as collaborations, teamwork, and critical thinking. These skills are essential for students to learn as they are necessary life skills to have and help develop relationships skills in education life. However, there is a misunderstanding where people assume the “A” stands for Creative Arts which include drawing, painting, paper and fabric making to name a few. Stop and think for a second and let’s see why one can’t make the argument for the “A” also to stand for Creative Writing or Performing Arts as well. After attending #NEcampLI and attending a few workshop one on Fractured Fairy Tales and one on Non-Fiction I have changed the way that I am teaching writing & STEM/STEAM. Currently, I have been playing around with a new lesson that involves reading the Three Little Pigs. After reading the students build a house out of straws, wood (popsicles sticks) and brick (index cards). The students are more engaged in the challenge and have a better understanding of their mission. I know I will be using Three Billy Goat Gruffs for when I do the bridge challenge with my students along with thinking of a way to tie in Little Red Sliding Hood (https://taralazar.com/taras-books/little-red-gliding-hood/). While the "doing" of STEM/STEAM work is key, the need to link it back to relevant learning is still paramount. That's why connecting to fairy tales is so powerful for younger learners. ​In the Non-Fiction Workshop, I heard from Susan Hood (@sHood125) who was sharing her book Ada’s Violin (http://www.susanhoodbooks.com/node/182) which is the story about Recycled Orchestra of Paraguay, an orchestra made up of children playing instruments built from recycled trash. How about reading that story to your students than having them making their instruments from recycled materials they can find at home or school. Often we discuss what the A in STEAM stands for, and the response is the Arts. Let’s make that Arts, not just the Creative Arts but Creative Writing and the Performing Arts as well. How to Moderate a #Edmodochat! There are many different ways in which to moderate a Twitter Chat. The first suggestion I would make would be to use a program in which you are comfortable using to moderate the chat. I personally enjoy using Tweetdeck as it is easy to have a column with the chat and interactions up at one time it also allows you to schedule tweets as well. Once you find a program that you find comfortable for you to use the next is deciding upon which questions you will use and the order in which you want to put them in. When planning an Edmodochat please make sure to use the edmodochat planner which can be found here: Depending on the topic will sometimes cause the questions to take a certain order other times it is a matter of preference or what you as the moderator will think will flow the best. Once you have established an order, it is always great to share with a a co-moderator for a second set of eyes. Remember we are representing Edmodo as ambassadors when we are moderating twitter chats, so make sure the questions are engaging and at Edmodo's expectation level. Once you have decided on the questions and the order you can always schedule your questions ahead of time so you will not forget to tweet out the questions at the correct time. When scheduling a tweet for a chat make sure you put question number with the question for example if you were doing questions one your tweet should be Q1 and remember the #Edmodochat. This allows the participants to respond with A and the number of the questions which helps for an easy to follow the chat. make sure you welcome as many people as you can to the chat. You want to make people feel welcomed thinking of it as part of your ambassador duty people want to feel like they are encouraged and positive to participating in the chat a simple Welcome, Glad to Have you, Good Evening makes someone feel special. It should be planned with your co-moderator as to who will retweet and reply to the participants, it could be either or both. keep the conversation going is the most important job as a moderator. It is only a short time we can engage with participants so make it memorable and keeping the flow of the conversation will help with that. When the chat is over there are a number of ways to archive the chat. The best program to use to archive chats is Participate Learning (https://www.participate.com/chats/edmodochat ) which easy to use you just need to select the time in which you want to archive the chat from and the date. Participate learning also allows for participation during chats as well and has areas in which the questions are posted. The archive includes the conversations along with any links that are shared during the chat. For more information on how to use Twitter in Education Purchase 140 Twitter Tips for Educators: Get Connected, Grow Your Professional Learning Network and Reinvigorate Your Career. Makerspaces are unique and attractive in today's schools. They offer a complete learning environment that allows limitless opportunities. However, we need to hear more discussion about how these spaces can be used by alllearning groups. This includes students with special needs as well as English-language learners. Students who have unique learning needs thrive in a makerspace because it allows them to express themselves without fear of failure. By providing equity and access, makerspaces are inviting and inclusive environments. Based on our work and experiences, we'd like to offer five ways in which makerspaces can provide learning for all. 1. Democratize LearningGreat makerspaces democratize learning. They make materials, supplies, and concepts available and accessible to all learners. By properly planning your makerspace, you can build an environment that levels the academic playing field for your students. One important attribute of this inclusive learning space is that it encourages tinkering, play, and open-ended exploration for everyone. When you assess the existing curricula, programs, and offerings within your school community, it's possible to pull out concepts that are frequently taught to a select number of students and make them available and accessible to anyone who's interested. 2. Low Barrier of EntryWhen a makerspace aligns its activities with the principles of creating a participatory culture, it can effectively meet all of our learners' needs. Most useful to consider is the idea of having a low barrier to artistic expression and civic engagement (PDF). This low barrier of entry into the makerspace activities will ensure that any of your students -- regardless of their academic proficiency level or even whether English is their primary language -- can begin making with very little or no teacher facilitation. Makerspaces offering open access to materials, supplies, and easy-to-start activities will guarantee successful and independent learners while limiting frustration. Despite this low barrier of entry, it's also possible to ensure that students find challenges here with the opportunity to take their learning as far as they choose -- a student-driven learning environment. 3. Visual CuesAn effective strategy to ensure that your makerspace helps to meet all of your learners' needs is using visual cues to communicate and give necessary directions. This strategy is especially beneficial for learners who have difficulty following complicated directions or remembering instructions for extended periods of time. Effective visual cues will support your learners in becoming independent thinkers and problem solvers, even if reading skills or language stand in their way under other circumstances. When creating signage and displays, it's important to give students enough information to motivate and inspire them, getting them started without giving them too much information, which might otherwise take away their opportunity to discover things through their making. These discoveries are sure to bolster their self-confidence, as well as increase their willingness to take risks. 4. ThemesThematically planned makerspaces provide opportunities to meet the needs of all learners. Supporting themes in varied ways will allow you to address your students' diverse learning styles by providing a suite of multimodal materials and resources to meet better their needs. Learning-disabled children -- and all learners, really -- benefit from utilizing as many of their sensory modalities as possible. Themes in a makerspace can also kickstart making and creativity by inspiring students and sparking ideas. They are helpful for students who might experience frustration and have trouble working with zero guidelines in place. 5. 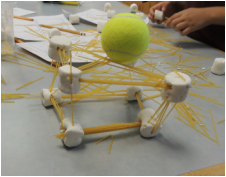 DifferentiationThere are many ways to differentiate effectively in a makerspace, such as providing the materials, activities, and supplies to meet the needs of mixed-ability learners. Another strategy is to consider differentiation as you plan the physical setup of your space. Centers or workstations encourage students to collaborate with their peers. The unique learning environment of a makerspace invites students of varying abilities to work together, creating a community of learners. Because they feel equal to their peers, English-language learners, as well as students with special needs, feel welcomed in these types of spaces. Another way to differentiate in a makerspace is by empowering students to follow their own process for making and creating, rather than attaching a prescriptive process. Your makerspace might be the only space in your school in which learners have the opportunity to take control of their learning in this way. This type of flexible, self-directed learning will empower as well as enhance all learners' unique learning abilities. A differentiated makerspace can allow students of all abilities to participate, experience success, and ultimately flourish. Along with the traditional methods, consider personalizing a student's learning path through the use of open educational resources (OER). Because they are free, OER provide both teachers and learners with equal access to high-quality content, which can be modified and customized to meet individual needs. Students can also seek out and shape their own resources, enabling them to be able to direct their own learning. Please tell us how a makerspace has contributed (or will contribute) to education equity at your school while opening the door to self-directed learning. Laura Fleming is a library media specialist at New Milford High School in New Milford, N.J. Fleming is the recipient of the National School Boards Association’s “20 to Watch” in educational technology leadership and the author of Worlds of Making: Best Practices for Establishing a Makerspace for Your School. Connect with her on her website or on Twitter @LFlemingEDU. Leading a group of teachers, a school, or a district or implementing an educational policy comes with enormous — yet incredibly rewarding — responsibility. Being the kind of leader who makes a positive, lasting impact takes a lot of effort and persistence. As a leader, you need to be sure you are feeding your spirit, mind, and body, especially since you are the model for many teachers, parents, and students. Reaching out to those with relevant experience will ensure that you receive the motivation, support, advice, and mentorship to help you successfully transform your community. One quick and easy way to connect with other administrators and locate resources is to take a few minutes each day to scan and contribute to hashtags, which are words or phrases that begin with a #-sign and are used to categorize conversations around a certain topic on social media. Click on any of the recommended hashtags below to connect with other school leaders and be inspired by what they accomplish in their communities. 1. #LeadUpChatJeff Veal (@heffrey), a professional learning facilitator, and Nathan Lang (@nalang1), a national content specialist at a leading education publishing house, founded the LeadUpNow movement, which seeks to shift paradigms of leadership structures in education by encouraging thought-provoking conversations. The hashtag chat inspired by this movement, which has been nominated for a Bammy Award, takes place every Saturday at 9:30 a.m. Eastern time. If you are a teacher who wants to find support, mentorship, and motivation to be a leader in your community, then this is the chat for you. 2. #CPChatThis Twitter chat belongs to the Connected Principals group, founded by George Couros (@GCouros), teaching consultant and principal of Parkland School Division. The group consists of a large network of principals, vice principals, and assistant principals from all over the world. The hashtag will take you to blogs, resources, events, and conferences to enable you to network with others in the field. You can also join the group’s chat on Twitter every Monday at 9:00 p.m. Eastern time. New principals looking to develop a personal learning network (PLN) will find a welcoming online community. This hashtag is also great for principals who want to learn how to integrate social media at their school with the aim of increasing family engagement. 3. #SATChatThis is one of the most popular Twitter chats dedicated to supporting school administrators. The chat is filled with resources and tools to help those in charge of leading schools. You’ll find an active community discussing various topics every Saturday at 7:30 a.m. Eastern time. The chat was founded by superintendent Scott Rocco (@ScottRRocco), educator Brad Currie (@BradMCurrie), and author and speaker Billy Krakower (@WKrakower). Scott Rocco is also the creator of #ASuperDay — a hashtag that, on every third Wednesday of the month, is use by superindents to share a story of excellence they’ve observed at schools in the districts they lead. 4. #SuptChatAnother great hashtag for top administrators is #SuptChat, which is an international chat for superintendents and school leaders that takes place the first Wednesday of every month at 8:00 p.m. Eastern time. This Bammy Award-nominated chat was founded by two superintendents in Illinois, Nicky Polyak (@npolyak) and Mike Lubelfeld (@mikelubelfeld). This option will connect you with leaders from around the world who are eager to make a difference in their communities. 5. #EdLeadershipConnect with superintendents, school board members, and other education leaders at the local and state level using this hashtag. Participants often post relevant articles or challenging questions to spark a debate in the community. Those seeking to continue their journey as a school leader will be able to find positions and ed leadership programs posted here. 6. #EdAdminFollow this hashtag to keep up with policies, news, and research related to school administration and leadership. Many instructional trends as well as education reform ideas are shared, discussed, and analyzed here. 7. #EdLeader21This is the hashtag of the EdLeader21 community, which represents a large network of school and district leaders who integrate the four Cs — critical thinking, communication, collaboration, and creativity — into education. The site itself is filled with free handouts, PDFs, and rubrics to support educational leadership. 8–10. #Leadership, #LeadwithGiants, and#LeadFromWithinThese aren’t specifically related to education, but provide leaders with motivational quotes and resources. Let these tweets inspire you while you sip your coffee in the morning and think about how to transform your classroom, school, or district. I find many of the quotes also keep me focused, grounded, and humble, which is important for being the kind of leader who makes a true impact. This article is part of a new series on top hashtags for teachers, school leadership, and parents. Read past articles, 10 Hashtags Every Teacher Should Follow or 36 Hastags to Stay on Top of Current Teaching Trends. And check back for these upcoming posts: Top Hashtags Every Parent Should Follow and The Best Hashtags for Teachers Integrating Technology. ​As the month of October is Connected Educators Month, I am extremely thankful that I have become a connected educator. Being connected has enabled me to learn, share and grow with a global network of passionate educators. This school year I was asked to create a STEAM (Science, Technology, Engineering, Arts and Math) lab. At the International Society for Technology conference (ISTE 2015) I decided to learn as much as I could about STEM/STEAM. I accomplished this by attending some sessions but more valuable for me was having conversations with members of my Personal Learning Network (PLN). Their experiences with teaching STEM classes really opened my ideas to all the possible projects I could do with the students in my classes. When I got to ISTE tweeted that I was looking forward to learning about STEM/STEAM. As a result I had a few people who said let’s chat. Those conversations that I had with several people including, Amanda Dykes (@amandacdykes), Katrina Keene (@teachintechgal), Nathan Stevens (@nathan_stevens), Meredith Martin (@geekyteach ) and Kevin Jarrett (@kjarrett) got me thinking and plans started forming. Over the summer I worked on ideas that can be done in my STEAM/Lab. I was faced with having a very tight schedule and basically no money. Thanks to being a connected educator I was able to shoot ideas back and forth and design an a area that would fit the needs of my students.. Since I did not have any funds I had to find ways to get money for the STEAM Lab. My good friend Meghan Everette (@bamameghan) suggested that we should apply for a grant through the ASCD Emerging Leader program which both of us had been a part of. Fortunately we won the grant. My next step was to talk with my administrators before school started about how the schedule would work. We came up with a cycle schedule so every class will go through the STEAM lab three times during the school year. I then had to figure out the exact projects I would be doing in the time I had. Once again I reached out to my PLN for ideas and had many conversations with others who have done this before. We currently have two projects planned for this Fall. After running the first cycle the students were excited about learning about engineers in our community. Thanks to being a connected educator I was able to bring this amazing learning experience to my students. With the help of my PLN the creation of a STEAM/STEM lab was made feasible to meet the needs of my school building. This is a contributed post from Billy Krakower, co-authored with Jerry Blumengarten. Connecting students in today’s fast-paced world is important, as students use their devices constantly, but need to find ways to do it educationally and responsibly. As educators, we need to expand our reach beyond our classroom walls. In 2012, I began participating in an activity called Mystery Skype with my Twitter friend, Nancy Carroll, in Massachusetts. This evolved into what we now call Mystery Location Calls. Ever since that first successful activity—and seeing the very positive reaction of my students—I decided to make connections as much a part of my lessons as possible. With the use of technology and the ever-changing landscape in education, I found using Google Hangouts and Skype to be amazing tools to help connect my students to the world. Using these tools, you can easily bring experts from all fields and parts of the world into your classroom to give your students first-hand explanations and answers to their questions. Because of limited school budgets and time factors, you can take your students to explore the world via virtual fields trips. There are so many free resources you can take advantage of to connect your students!Our book, “Connecting Your Students to the World: Tools and Projects to Make Global Collaboration Come Alive,” will be released on September 24. This book explains ways teachers have successfully joined their students to other classes around the world. We present many ideas and projects that you can do with your students during fall, winter, spring and even summer. One of my favorite projects was connecting with my friend Nancy when she brought her class to Plimoth Plantation (MA) in November. What’s more, my students have had the opportunity to sing holiday songs with a class in Canada via Google Hangouts. During Read Across America Day in March, I loved connecting my students with Jerry as he read Dr. Seuss’s book The Cat in the Hat Comes Back to several classes at once via Google Hangouts. Skype in the Classroom offers many projects and experts that you can can also bring into your classroom, too. There’s a multitude of ways in which you can knock down your classroom walls. An easy way to start is by joining one of the many communities on Google+, or sign up to participate on Skype in the Classroom. Some of our favorite Google+ Communities are Google Hangouts in Education, G+eduhangout or Mystery Location Calls. Twitter is another easy way to get started, as you can reach out to different educators, or follow hashtags based upon your grade level or subject area. In this way, you can find other teachers all over the world to start collaborating with. Start by exploring some educational hashtags. Another great place to find a Twitter chat to follow and to start making teacher connections is the Twitter Education Chats Schedule. Technologies like Google Hangouts and Skype make it easy (and affordable) to connect their students to the world, providing them with cultural experiences and new perspectives without ever leaving the classroom. To learn more about globally connecting your students through technology, check out “Connecting Your Students to the World: Tools and Projects to Make Global Collaboration Come Alive,” available September 24. Co-author Jerry Blumengarten is an educational consultant, speaker, and author. Find on Twitter,@cybraryman1. Billy is one of the Founding Partners of Evolving Educators LLC. He is a 2014 ASCD Emerging Leader, and a Microsoft Office Specialist. Learn more about Billy by visiting his website at http://www.billykrakower.com. Often times I am asked why do you feel that it is important to be a connected educator. As a connected educator I gain new ideas, inspiration and insightful information from my my PLN daily. I have a group of people that I can reach out to 24/7 for anything I need. New worlds and opportunities have opened up to me. I have been able to participate at the live event of Digital Learning Day and become an author of three educational books. I have grown myself as a teacher leader and become an integral part of several leading educational organizations. Being connected has enabled me to present at leading educational and technology conferences. My nomination for School Technology http://www.bammyawards.org/nominations/index.php/component/content/article/79-school-technology-support/1653-billy-krakower.html Feel free to also cast a vote for me. I was also nominated for two other awards with my co-moderators of #Satchat and #Satchat Radio. #Satchat was the first nomination in a new category titled: Twitter Communities: http://www.bammyawards.org/nominations/index.php/component/content/article/96-twitter-chat-comunity/1659-satchat.html. There are so many educators who are still not connected. Scott Rocco had an idea that we should take one #Satchat and bring a friend who is not connected to participate in a #Satchat and show them the world of being a connected educator: http://www.evolvingeducators.com/connect-an-educator-day.html. All of the opportunities that I have had are all because I became a connected educator. Make sure to bring an educator on May 2, 2015 to #satchat to show them the world of being a connected educator.